This place has a lot of character and a wonderful concept. The interior is a complete diner concept with quirks like a taxidermy fox thrown in for good measure. We started with a West Island Iced Tea from the extensive cocktail list (only 6$) and a pint of Blonde du Palais. The West Island Iced tea is a mix of Vodka, Gin, Tequila, Rum, Galliano, Citron and Coke – a formidable brew to be certain. The Blonde du Palais is a special beer from McAuslan Brewery made only for certain restaurants and as our waiter put it “we get to call it whatever we want”. This intrigued me because I’ve been many restaurants with their own “house” blonde beer and I wonder how many of those were actually from McAuslan? Anyways, the beer was great – very light and easy to drink with the meal. We started with the Zucchini fritters (we love the corn fritters that are offered on Grumman taco nights). 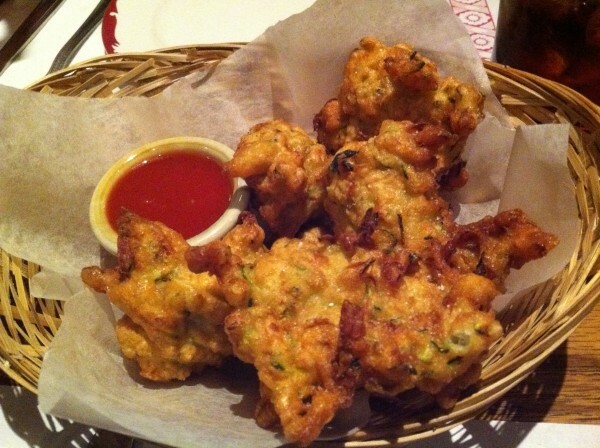 The fritters were deep fried to order and tasted fresh and soft – served with a great dipping sauce. For mains we ordered the Shrimp Po Boy Sandwich and Hunter’s Chicken with a side of Macaroni and Cheese. The Shrimp Po Boy was a lovely take on the classic Po Boy sandwich with fried shrimp, cabbage, pickles, lettuce and a sweet sauce on a warm poppy seed bun. The shrimp were warm, crispy and tasted great with the other components of the sandwich. The Hunter’s Chicken was also a simple dish with deep flavors. The chicken is stewed in a thick tomato sauce with onions and black olives to the point were the meat itself has absorbed the flavors. My shameful secret is that part of the reason why I even ordered this dish was for the biscuits and let me tell you I was not ONE BIT disappointed. They were so rich and soft – absolutely delicious. 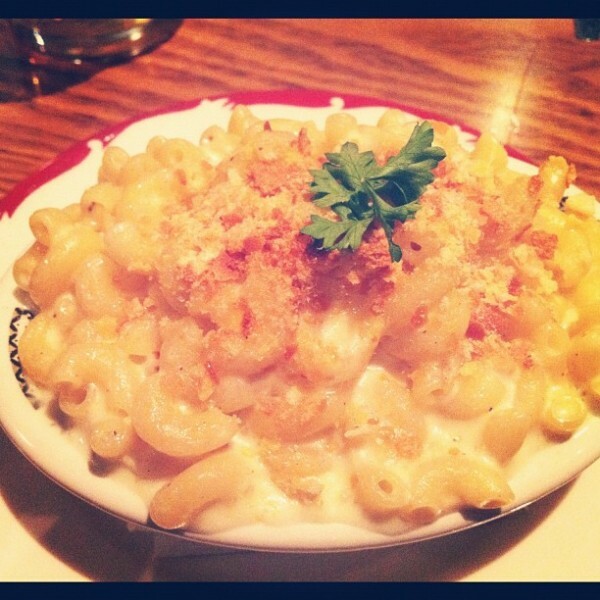 The photo of the Mac and Cheese above speaks for itself. The cheese was mix of sticky and creamy with a crunchy chewy top and gooey layers underneath. Can’t recommend this place enough – reasonable prices, delicious comfort food and great drink selections. Tags: Chicken, Cocktails, feature, forkandtell, Fritters, Mac & Cheese, Montreal, Nouveau Palais, Po Boy, Shrimp, St. Ambroise, Zucchini. I've been searching for shrimp po boys everywhere in Montreal! Do they always have that on their menu, or was it a special item? Please let me know! Thanks!